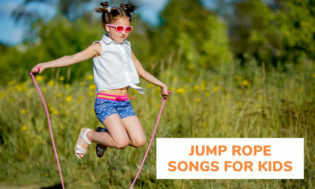 You need some good jump rope songs and games, we have them. 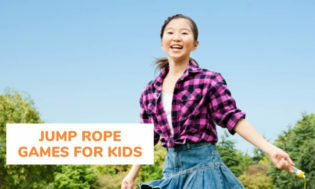 Here you will find an extensive list of jump rope rhymes and activities that are sure to bring hours of fun and laughter. Jumping rope is still a favorite on most playgrounds. Whether alone or in a group, jumping rope challenges both coordination and stamina. It’s also a unique part of our cultural heritage. Historically it was first a game primarily for boys. Males usually did not use rhymes. Instead they spent their time on trick jumps: crossovers, double jumping, and peppers. Migration of Americans from farms to towns and cities led to girls taking over this unique pastime of jump roping. One theory for this is that girls now had more time to play than they had back on the farm, and more friends to play with. On smooth city streets they put together dozens of games and hundreds of rhymes that make up modern jump rope lore. changed him into Bubble up! 1, 2, 3…. (Keep counting until the jumper messes up). who’s your boyfriend/girlfriend I forgot? A,B,C,D,E,F,G,H (and so on until the person stops jumping) You take the letter he/she lands on and think of a name of someone you know that begins with the letter. , Teddy Bear, Teddy Bear, touch the ground– Teddy Bear, Teddy Bear, show your shoe-Teddy Bear, Teddy Bear, that will do!–Teddy Bear, Teddy Bear, go upstairs–Teddy Bear, Teddy Bear, say your prayers–Teddy Bear, Teddy Bear, turn out the lights-Teddy Bear, Teddy Bear, say good-night! The children jump rope while they sing this rhyme, they act out the actions as the words come up in the rhyme. An example: when they say go upstairs, the child pretends to climb the stairs. The next thing you know he had a bubble in his throat. “Peel a banana upside down; see if you can touch the ground.” (the jumper tries to touch the ground without being tripped by the rope),” If you spell your name correct, you will get another chance . . .” The jumper then spells her name, including saying “capital” for uppercase letters of her name. If the jumper trips or messes up the spelling, it’s another jumper’s turn. –who’s gonna be your lucky guy? a, b, c, d, e, f, g etc.. Until the jumper misses. There sat (jumper) pretty as a rose. How many kisses did she get this week? Count until jumper misses. sat on a curbstone shooting dice. The horse, he slipped and fell on the flea. Keep track of who has what score- then see who has the highest count. For Kindergarten they run through the rope without jumping, first grade they jump once, and so on… If they miss as they are jumping, they have to start over at Kindergarten. Decide how many will jump in! Participants jump in one at a time until everyone is in the rope. All the rest are dirty bums! “ALL, ALL , ALL …” until the last person is in the rope. Say the chant and then the participants will exit on their birthday month. 20. YOUNG CHILDREN can also enjoy jump rope games. 22. JUMP ROPE WATER SPLASH! Give each child a plastic or paper cup full of water. While two players twirl a large jump rope, jumpers one by one are to attempt three consecutive jumps. They are to do this while holding onto their cup of water and trying to do let any water spill. The child that has the most water left is the winner. Need one jump rope per Team…Divide group into several small groups. The first player of each group runs to their jump rope-which is placed about 30 feet in front of each group. They then do five jumps and return to the group. The first group/team to finish is the winner. Extension Play…Jump backwards-five times; Jump five times on your left leg (or right leg); Jump rope and say the multiplication table of fives. Do this until you get to fifty–say one number each time you jump. TO YOUR GROUP! START A CLUB OR TEAM! Children in this grade level will begin to enjoy jumping double Dutch. Double Dutch uses two people holding each side of the rope, but the trick is they use two ropes instead of one. Those who are swinging the rope would swing the rope in their left hand to the left and the rope in his right hand to the right. The on looking children then jump the double ropes. As participants become more skilled, the person jumping usually does tricks that may involve gymnastics or break dancing and can also incorporate fancy foot movements. Young people do this for fitness and it is competed at world level. Double Dutch competitions are categorized as compulsory, free style and speed rope. There is no way any kids will think that jumping rope is for younger children once they realize the skill and sportmanship needed! Click on other group videos while there! This isn’t jumping rope-but something you can do with jump ropes! 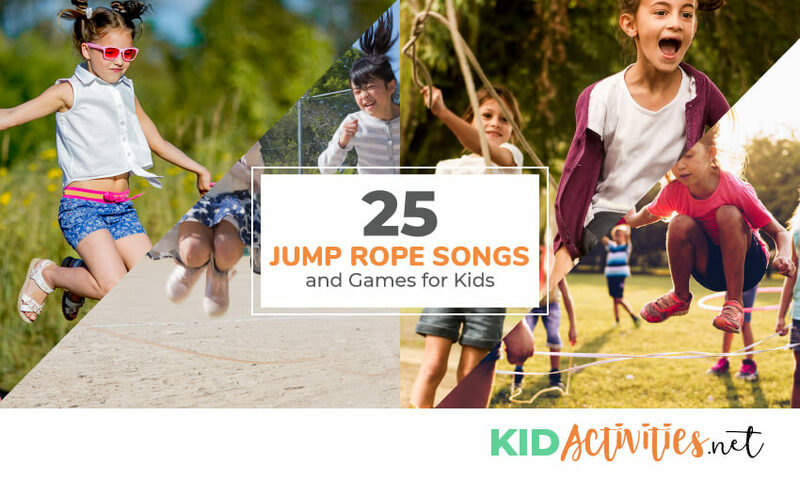 There you have it a list of 25 jump rope songs and jump rope games. Make sure you check out our list of fun outdoor summer activities as well.